^ Shimon Glick. 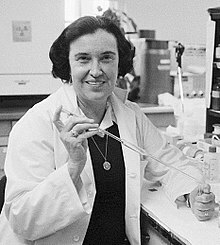 Rosalyn Sussman Yalow (1921–2011). Nature. 2011-06-29, 474 (7353): 580–580 [2018-04-02]. doi:10.1038/474580a （英语）. ^ Rosalyn Sussman Yalow. America.gov. 2008-04-27 [2010-06-26]. ^ Book of Members, 1780–2010: Chapter Y (PDF). American Academy of Arts and Sciences. [2011-06-02]. Opfell, Olga S. The Lady Laureates : Women Who Have Won the Nobel Prize. Metuchen, N.J & London: Scarecrow Press, Inc. 1978: 224–233. ISBN 0810811618.